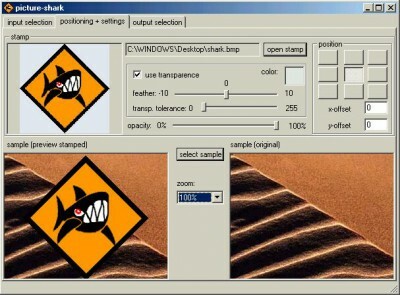 picture-shark 1.0 free download. With Picture-shark you can watermark and copyright your picture galleries. With Picture-shark you can watermark and copyright your picture galleries. Use logos, texts or any other images. With its wizardlike interface you can easily create impressive results. Picture-shark processes houndreds of pictures in a minute. It supports transparence and realtime preview. The unique feather feature generates smart edges within one click. Picture-shark rises above all other products due to its speed, compatibility with all windows operating systems, the small file size and its realtime preview. After setting position, transparent color, opacity and feather (smart edges), these settings are applied in batchmode to all pictures regardless of their size. Standard file-formats and different jpg-compressions are supported. Picture-shark's impressive advantage is it's "feather"-feature. It smoothes the edges between the applied watermark and the picture. It applies antialiasing to the stamp and removes the "edged" borders. With ICQLite PictureChanger 3 you can remove the advertising banners from your ICQ Lite and replace the banner above your contactlist with an own picture. Photo or picture watermarking is a very important aspect to keeping your images safe and to stop others copying your photo's. visMill is an application, that prepares any pictures or images for usage as visDoors (password picture) for our products visKey, visKeeper und visNotes. MSN My Picture can help you customize your MSN Messenger picture.